If you have a team of .Oriflame Managers here are some tips that will help you help your team recruit! Using these tips will help you and your team grow your businesses. I believe strongly in the phrase : Together Everyone Achieves More. With Oriflame Management , your success is my success, so it’s in my best interests to help my team. 1. Be the best recruiter in your team. Set the example for your team to follow – lead from the front. You will gain valuable experience which you can then share with your team. 2. Set incentives or competitions for your team “who can get the most recruits”. 3. Believe in your Oriflame Manager , even if they don’t yet have the confidence or believe in themselves yet. 4. Go out together either as a group or in pairs with your Oriflame Manager This is great bonding as well as a good time to coach and share skills. 5. Recognise your recruiting superstars. Celebrate successes with your team. 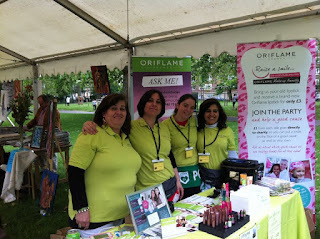 Building a team of Oriflame Manager s (as well as consultants ) does take time and effort. I will always go out and train my Oriflame Manager s and continue to meet with my Oriflame Managers to recruit and prospect. It can be a lot of fun, and we do vary the methods of recruiting. Whether it be a town centre or recruitment fair, I will be there supporting my team. I like activities that I can work around my lifestyle and my children, and so totally respect other people’s time pressures. Fundamentally, I believe if you coach your team in the key skills of recruiting this will build competence which in turn will build their confidence.